Pull out your yearbooks everyone, and let’s take it back to 1996! Our first Alumni Spotlight is Becky Herman. 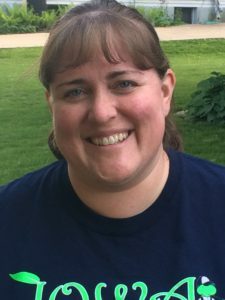 Becky grew up in New Windsor, Maryland and only spent two years at Linn-Mar High School, but she really enjoyed her time spent in Iowa. Becky graduated in 1996, and was then known as Becky Humbert. After high school, she decided to stay in Iowa, attending Coe College for her Bachelor of Arts and Master of Arts in Teaching. She then went on to the University of Iowa for her Masters in Educational Leadership. Since graduating, Becky has been quite busy! Becky, her husband Jason, and their daughter Stori, now live in Keystone, Iowa. Currently, she is a teacher at Iowa BIG, (fun fact: Becky is the supervising teacher on the project that brought you this website! ), and she also owns Iowa Cricket Farmer LLC, which is the first and only human edible insect farm in Iowa. In her free time, she really enjoys reading, eating at her favorite restaurant, the Irish Democrat, participating in pub trivia, and of course, cricket farming! Becky also likes to travel, with her favorite place she has ever visited being London, England, but she says that Sydney, Australia is a close second. When looking back on her time at Linn-Mar, Becky remembers her experiences quite fondly, especially memories made with her sports teams. After moving to Linn-Mar at the beginning of her junior year, Becky joined the basketball and soccer teams. Soccer was very new to Linn-Mar at the time, but Becky had played soccer for many years back in Maryland. Soon she became known as “the new girl that plays soccer.” Her fellow teammates made her feel welcome by taking her to football games and introducing her to new people. She also remembers her teachers, enjoying time in Mr. Finney’s anatomy class, and sitting with friends in the back of Huffman’s Brit Lit class. Her fellow classmates told her that she talked too slow when sure first moved to Iowa, must be a Maryland thing!